In the last half century, fluoride has become an effective weapon against tooth decay. The naturally occurring mineral helps strengthen enamel, the teeth's hard, protective cover. Although it's safe for consumption overall, too much during early tooth development can lead to fluorosis, a brownish, mottled staining in enamel. To avoid it, a child's daily consumption of fluoride should optimally be kept at around 0.05-0.07 milligrams per kilogram of body weight, or an amount equal to one-tenth of a grain of salt per two pounds of weight. The two main therapeutic fluoride sources have limits to help maintain this balance: utilities that fluoridate drinking water are required to add no more than 4 parts fluoride per million (ppm) of water; toothpaste manufacturers likewise only add a small amount of fluoride compared to clinical gels and pastes dentists apply to teeth for added decay protection. But drinking water and toothpaste aren't the only sources of fluoride your child may encounter. Even if you have a non-fluoridated water supply, you should still keep a close watch on the following items that could contain fluoride, and discuss with us if you should take any action in regard to them. Infant formula. The powdered form especially if mixed with fluoridated water can result in fluoride concentrations 100 to 200 times higher than breast or cow's milk. If there's a concern, use fluoride-free distilled or bottled spring water to mix formula. Beverages. Many manufacturers use fluoridated water preparing a number of packaged beverages including sodas (two-thirds of those manufactured exceed .6 ppm), soft drinks and reconstituted fruit juices. You may need to limit your family's consumption of these kinds of beverages. Certain foods. Processed foods like cereals, soups or containing fish or mechanically separated chicken can have high fluoride concentrations, especially if fluoridated water was used in their processing. When combined with other fluoride sources, their consumption could put children at higher risk for fluorosis. Toothpaste. Although mentioned previously as a moderate fluoride source, you should still pay attention to how much your child uses. 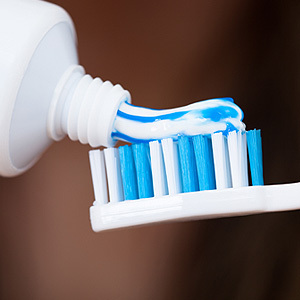 It doesn't take much: in fact, a full brush of toothpaste is too much, even for an adult. For an infant, you only need a smear on the end of the brush; as they grow older you can increase it but to no more than a pea-sized amount.